The Exterminator Slot by Betsoft Gaming is a slot with five reels, three rows and 30 adjustable paylines. 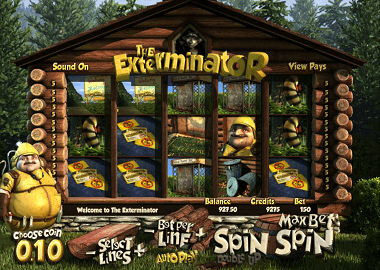 Like many Betsoft online slots, The Exterminator has 3D effects. The reels are built in a log cabin and on the left side is the exterminator himself in his yellow outfit. The slots offers a whole bunch of bonus feature and these include Sticky Wins, Wild Reels and of course a Free Feature. There is an auto play feature and the minimum bet is only £0.02. Also for Highroller this game is interesting because the maximum bet per spin is £150! Symbols and payouts: The Exterminator Slot does not have any playing card symbols, but only themed related symbols. These include a welcome mat, a racoon tail, Alvin, the pesky racoon, dustbins, a wire trap, a Raccoon City sign and some business cards. The truck is your wild symbol and there are two different scatter symbols, the footprint and the blueprint. Both activate features and Alvin the exterminator and the raccon are the most valuable symbols in the the base game. Wild Symbol Feature: Usually we do not explain the Wild symbol, but the Exterminator slot is worth a second look. Here is the game the truck symbol. If it lands on your reels, it will expand to fill up the Entire reel and therefore you build additional pay-lines and winnings. Sticky Win Feature: The Sticky Win feature is the main feature of The Exterminator Slot and you can experience the feature in the base game and Free Spins feature. Every time you get a win on a payline, your symbols will stay in place and a re-spin will be triggered. This is repeated until no new paylines land on your reels and at the end, all winnings are paid out. Free Spins Feature: You trigger the Great Raccoon Chase bonus free spins with five or more footprint symbols. These are not simple free spins, but the re-spins feature can be triggered. In addition, each of your winnings will be rewarded with a win multiplier. Up to 5 times the normal profits are paid. Pick and Win Feature: The Pick and Win feature on The Exterminator Slot is triggered with five or more blueprint scatter symbols. This starts a mini game where you land on an extra screen. Here you will be asked to pick one of the highlighted areas to reveal a cash prize. Many of the bonus features on The Exterminator Slot are hard to explain. That’s why we recommend you to play the game here for free. Open the game by clicking on the slot banner above. Other popular Betsoft online slots are After Night Falls, Good Girl Bad Girl or At the Movies. At the bottom in the table you can also find online casinos with Betsoft 3D games. Next Casino, Wild Slots or even Spinland are all popular UK casinos with a great reputation and they offer a massive range of online slots. Play there and use the lucrative bonus offers along with your registration!